A replica of the Hermione, the 18th century ship that brought French General Lafayette to America, sailed the waters off New York on Saturday (Jul 4), leading a flotilla marking the Independence Day holiday. NEW YORK: A replica of the Hermione, the 18th century ship that brought French General Lafayette to America, sailed the waters off New York on Saturday (Jul 4), leading a flotilla marking the Independence Day holiday. The faithful reproduction of the majestic French frigate glided past New York's famed Verrazano bridge, where it was joined by scores of other boats and ships. The flotilla then made its way toward Liberty Island in New York Harbor past a symbol of the two nations' enduring friendship - the towering Statue of Liberty, a gift to the US from France in 1884. 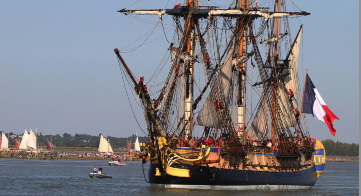 The Hermione replica - which took almost two decades to build - departed France's western coast in mid-April, retracing a 3,700-mile (6,000-kilometre) journey across the Atlantic. It arrived in New York earlier this week for July Fourth festivities and had been docked at Pier 15 in south Manhattan on the East River. The original three-masted Hermione brought General Lafayette to America to rally US patriots fighting for independence from Britain. The ship arrived in the US nearly a month ago, stopping first in Yorktown, Virginia, where American forces led by General George Washington and French soldiers scored a decisive victory over the British in 1781, prompting their capitulation. The original Hermione was used in that battle. On its way to New York, the ship stopped again in Mount Vernon, Virginia, just outside Washington, then in Annapolis and Baltimore, both in Maryland, and in Philadelphia. It will move on to Boston and then to Canada. New York was the last city liberated by Washington's troops, in 1783. The metropolis now known as the Big Apple served briefly as US capital, from 1785 to 1790. Porthole is one of the most important US cruise magazine featuring exciting editorial and stunning photos on cruises, from ship reviews and destinations to life onboard and ashore. Porthole Cruise Magazine�s Readers� Choice Awards are determined, each year, by thousands of the publication�s readers who vote on their favorite cruise lines in a variety of categories. Most important innovations include the new flagship Costa Diadema, ambassador of Italy�s finest, with 7-day cruises offering guests the chance of visiting in a single cruise Florence and Rome, two of the most popular Italian cities, and beautiful Mediterranean cities like Barcelona and Marseille. In addition, Costa Mediterranea introduced one week cruises from Trieste and Venice to discover Croatia, Greece and Montenegro. Among the wide range of cruises in the Mediterranean Sea, in 2015 Costa proposed Costa neoCollection itineraries with Costa neoRiviera, Costa neoRomantica and Costa neoClassica, which offer �slow� cruises away from the bustle of mass tourism in the eastern and western Mediterranean, including destinations declared UNESCO World Heritage Sites. Join us and enjoy an opportunity to meet Mr. Cousteau in person. As our special guest, he will offer a series of lectures with videos of his work in the world�s oceans, as well as accompany several dives from the ship. In 1999, Jean-Michel Cousteau's passion for the sea led him to found the Ocean Futures Society, whose mission is to explore the world�s oceans, inspiring and educating people throughout the world to act responsibly for its protection, documenting the critical connection between humanity and nature, and celebrating the ocean�s vital importance to the survival of all life on our planet. Mr. Cousteau serves as president and chairman of the board. Reaching millions of people globally through this organization, Mr. Cousteau has produced environmentally oriented adventure programs and television specials, public service announcements, multi-media programs for schools, web-based marine content, books, articles for magazines, and public lectures. As Chairman of the Board and President of Ocean Futures Society, he also travels the world, meeting with leaders and policymakers at the grassroots level and at the highest echelons of government and business, lending his reputation and support to energize alliances for positive change. In addition to these milestones, Mr. Cousteau has produced more than 80 films and received numerous prestigious awards, including the Emmy, Peabody, 7 d�Or, and Cable Ace Awards. Since 1989, Mr. Cousteau has also served as a syndicated columnist for the Los Angeles Times. In this capacity, his articles have appeared in more than 60 newspapers worldwide. In the course of these activities, Mr. Cousteau has been recognized for a number of �firsts� in a variety of arenas. For example, in February 2002, he became the first person to represent the Environment in the Opening Ceremony of the Olympic Games in Salt Lake City, joining luminaries including Archbishop Desmond Tutu (Africa), John Glenn (The Americas), Kazuyoshi Funaki (Asia), Lech Walesa (Europe), Cathy Freeman (Oceania), Jean-Claude Killy (Sport), and Steven Spielberg (Culture). In another �first,� on Earth Day 1997, he led the first undersea live, interactive video chat from the coral reefs of Fiji, celebrating the International Year of the Reef and answering questions from �armchair divers� throughout the world. And in 1998, he participated in a live downlink from the Space Shuttle Columbia to CNN to highlight the International Year of the Ocean, discussing NASA�s contribution to ocean awareness with astronaut and marine biologist, Rick Linnehan. Not surprisingly, Mr. Cousteau has received numerous awards throughout his career, including the Environmental Hero Award, presented to him in 1998 by then-Vice President Gore, and in 2003 he was inducted into the International SCUBA Diving Hall of Fame. An architect by training, Mr. Cousteau began his career by founding Living Design, an architectural firm that specialized in marine architecture and has a long history of innovative design in the field of architecture and the ocean. More recently, he has been involved with the Jean-Michel Cousteau Fiji Islands Resort, an environmentally and culturally oriented family resort, conceived as a model to prove to the business community the economic benefits of environmental concern and design. He is the son of ocean explorer Jacques Cousteau. From the moment you arrive, you will have your first Polynesian experience with traditional Polynesian lei made fem the fragrant Tiare flower which means "las Orana" or "Hello" and "Manava" or "Welcome". As you leave, Tahitians will share their appreciation for your visit with a traditional shell lei necklace made from tiny polish made from tiny polished shells from the sea meaning "Nana" or "Goodbye" an "Maruru" or "Thank you! TETIAROA, French Polynesia - The Brando, an exquisite luxury resort on French Polynesia's breathtakingly beautiful private atoll of Tetiaroa, composed of a dozen idyllic islets surrounding a sparkling lagoon 30 miles north of Tahiti, officially opens today to guests. Setting a new world standard, The Brando is a pioneering model of sustainable technology with seawater air-conditioning and renewable energies, without any sacrifice to luxury or comfort. Designed to reflect Polynesian lifestyles and culture, the all-inclusive resort features 35 deluxe villas, each with its own private beach area and plunge pool and offers carefree luxury in the midst of pristine nature. Exclusive and private, access to The Brando is a 20-minute flight from Tahiti by Air Tetiaroa to Tetiaroa's airfield. "There is nothing like The Brando in the world, and we look forward to sharing this paradise with our guests and making their stays with us truly memorable and life enriching," said Silvio Bion, General Manager, The Brando. The award-winning cuisine of Guy Martin of the Michelin two star restaurant Le Grand Vefour in Paris is featured in all dining venues and in-room dining. The resort's two restaurants showcase Polynesian-inspired dishes, East/West fusion and classic French cuisine. Les Mutines is The Brando's fine dining restaurant with a world-class wine cellar. The Beachfront Cafe offers indoor and beach dining. The resort's Te Manu Bar features lagoon views and private tree-top seating areas reached on walkways through a palm canopy. Bob's Bar is a casual setting on the beach. An abundance of activities are available at The Brando including snorkeling in a coral garden, paddle boarding, kayaking, Polynesian canoeing, scuba diving, tennis, biking, swimming, exploration of the untouched private islets surrounding the lagoon, and guided tours by naturalists. The resort also has a Library and Explorer Center where guests can read books about French Polynesia and attend lectures and demonstrations about Polynesian culture, history and lifestyle. Onsite research scientists will speak with guests about their research and the species of birds and marine life found on the atoll. A luxury pearl shop and a boutique are also located on the property. The Brando was inspired by Marlon Brando's original vision to create a venture of sustainable development that resonates with visitors and fosters opportunities to get to know both the place and people of French Polynesia.He was passionate about preserving Tetiaroa's natural beauty, biodiversity and cultural richness and was determined to find a way in which it could be a center for research and education and a model of sustainability. 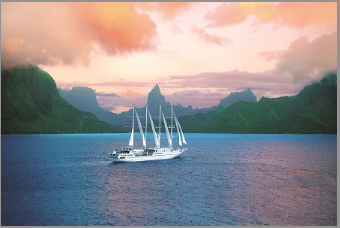 In 1999 Brando asked Richard Bailey of Pacific Beachcomber S.C., a long-time resident of Tahiti who shared his passion for the environment and who had created some of the region's finest resorts, to help him conceive a plan that would help him achieve his dream. Together, Brando and Bailey pursued a vision of creating the world's first and foremost post-carbon resort�an island where innovative new technologies would enable a self-sustaining luxury environment for resort guests, residents and scientific research. The Brando is the legacy of that shared vision and the resort is committed to protecting the precious biodiversity of Tetiaroa. An Ecostation on Tetiaroa has been established in pursuit of Brando's dream with its operation entrusted to Tetiaroa Society, a 501 (c)(3) U.S. non profit dedicated to inspiring sustainable interdependence through education, conservation, and creative science. Current projects include a survey of the archaeological sites of Tetiaroa, a GIS mapping of the atoll, and ocean acidification research. Guests of The Brando will be able to experience first hand Brando's vision of having a "University of the Sea" by visiting the Ecostation, interacting with scientists in the field, and actively participating in studies conducted by some of the world's leading research institutions. 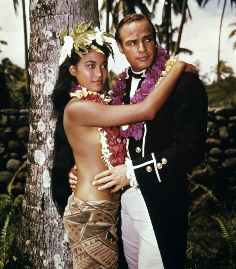 The Brando is also working closely with Te Mana O Te Moana, a Tahiti-based nonprofit organization devoted to the conservation of marine wildlife�particularly the green sea turtle on Tetiaroa, but also marine mammals, sharks, rays, and coral reef across French Polynesia. Pacific Beachcomber has collaborated closely with Te Mana O Te Moana over the past ten years. Te Mana O Te Moana is consulting on implementing excursions on Tetiaroa's lagoon and motu and is also developing a variety of youth-oriented educational programs. The organization has developed educational materials and programs approved by the local authorities, reaching more than 50,000 school children to date. Ms. Goufrani's views on Cruising Africa to appear during 2001 in this section and in print. Peace Through Tourism Conference, Glasgow, Scotland, 1999: "You've seen what the Cruise Industry has done for Alaska and the Caribbean, with their floating hotels and a vast armada of pocket cruise ships. Can you imagine what would happen if Africans built a profitable cruise industry around their most ancient means of travel? Just think of romantic adventure cruise opportunities on our lakes, rivers and our historic, exotic coastline? The Gold Coast, the Ivory Coast, the Cape of Good Hope, the Indian Ocean Coast and its treasured islands, the Red Sea and Suez Canal. Yes, as Mr. Salia says about Africa, "Water transport is generally neglected and undervalued." Perhaps this sleeping giant will also awaken." "From the soaring tree-clad mountains, to the looming glaciers, to the breathtaking waterfalls, the passing panorama is just so vast, so overwhelming, it would take the most cynical and world-weary not to be impressed by it." See previous page on this site. At our Air & Marine Tourism Conference, we had the pleasure of hearing a talk on Cruising by Mr. William Kelly of Vancouver. A trained journalist and veteran travel writer, William Kelly is an expert on cruising. His company, Ocean Cruise Guides, has published a series of guidebooks which are distributed worldwide. Current titles include Alaska By Cruise Ship, Caribbean By Cruise Ship and The Complete Cruise Handbook, used by travel agents and cruise passengers as a reference source and indispensable guide when cruising.